WATERLOO – Wilfrid Laurier University is one of 10 Canadian post-secondary institutions featured in the seventh edition of The Princeton Review Guide to 361 Green Colleges. 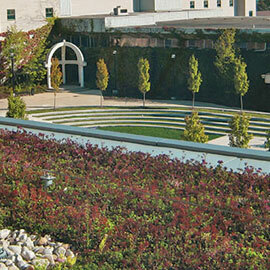 The book highlights 361 of the most environmentally responsible colleges in North America. The Princeton Review selected the schools based on data from the company's 2015-16 survey of hundreds of four-year colleges concerning the schools' commitments to the environment and sustainability. Laurier was noted for its transportation alternatives including bike storage and share stations, carpool initiatives, percentage of new buildings that were LEED-certified, greenhouse gas reduction plan and for having a Sustainability Office. The Princeton Review is an education services company known for its test prep and tutoring services, books, and college rankings. The Princeton Review first published this guide in 2010. It remains the only free, annually updated downloadable guide to green colleges. The company is also known for its dozens of categories of college rankings in its annual books, The Best 381 Colleges and Colleges That Pay You Back. The Laurier Sustainability Office opened in January, 2010. The office creates and fosters a culture of sustainability by engaging, promoting and coordinating the sustainability efforts of all stakeholders to develop an environmentally proactive Laurier community. Laurier continues to demonstrate significant commitment to advancing sustainability efforts. The university recently launched the CAB Bike Share Station on the Waterloo campus to provide affordable access to bicycles as alternative transportation to students, staff, faculty and community members. Laurier has also established the Sustainable Hawk Fund, which grants up to $20,000 annually to help grow sustainability ideas that benefit the Laurier community. Find more information about sustainability efforts at Laurier.